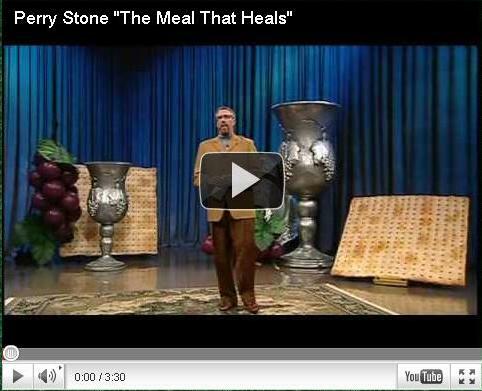 Perry Stone And 'The Meal That Heals'??? So was that one strong enough for you – or maybe just a little bit TOO STRONG? I mean without a doubt those were some pretty “tough and rough” Words for anyone to speak about someone so charismatic (captivating, charming, and appealing) as Brother Stone. In fact I am personally (me, myself, and I) having a very hard time believing that Perry Stone has actually “gone and done” what he’s actually “gone and done”. The Biblical revelation contained in this book will not only challenge your spirit, but could possibly extend the days of your life! Several years ago, Dr. John Miller first introduced this truth to Perry Stone. 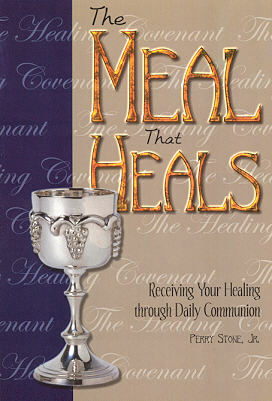 Perry believes this revelation of daily Communion has been lost in the traditional church, but is being revived in this final hour as the ultimate New Covenant weapon to attack sickness and bring healing in the lives of Christians! This is not just another message, but a life-changing spiritual revelation of God's healing covenant through the bread and the fruit of the vine. Now even though I smelled a “rat” the first time I laid eyes on “Brother” Miller, the Almighty has seen fit to call him a “wolf”…so who am I to argue with God? A wolf it is! In fact what’s so terrible about this “ratty wolf” situation with Dr. Miller is that he’s none other than a Roman Catholic “Jesuit” posing as an “anti-Catholic” protestant. In other words Dr. Miller is a “wolf” pretending to be a “sheep” who the “shepherd” (Perry Stone) has invited into the Father’s “sheep fold” (the flock) to have lunch!!! And just in case you haven’t been privy to God’s “Truth” about the Jesuits, please let me share with you what I’ve learned through the “Alberto Series” from Chick Publications. Because you see there was once a man by the name of Dr. Alberto Rivera who became a Jesuit priest in the Roman Catholic Church…but then he found Jesus. And it was during the time before his conversion to Christ that Brother Rivera witnessed many of the “unspeakable” horrors that take place “behind the scenes” in the Roman Catholic Church. And, quite naturally so, once Brother Rivera made Jesus Christ his Lord and Saviour, he found it necessary to “spill the beans” by exposing the Truth about the spirit of Anti-Christ within the Roman Catholic Church. In fact the “Alberto” six-part comic series was created through the combined efforts of Brother Alberto Rivera and Brother Jack Chick in order to do just that! So just what did you think about that? Did it blow you away? Did it make your blood boil? Do you now want to throw up? Has the “hidden agenda” of “Brother” Miller and the Roman Catholic “Jesuits” become blatantly obvious by now – like “in your face”? Do you understand why I call “Jesuit” Miller a “big fat rat”? Do you understand why Father God calls “Jesuit” Miller a “ravenous wolf”? OK, so the bottom line to this ”Jesuit thing” is that they (the Jesuits of the Society of Jesus) are trained and conditioned to “brainwash Christians” into believing the “lies of Satan” as practiced by the Roman Catholic Church. And when it comes to the “one big LIE” that Jesuit Miller has enticed Brother Stone to teach and preach through “The Meal That Heals” program, what better way for me to show you “what it is” and “how it works” than through the personal testimony of a brainwashed Christian! Because you see as I was preparing to write this sermonet the Lord had me do a little research on the Internet. And what I soon discovered somewhere along the way was an impressive “Cowboy Stuff Ministries” that had whole-heartedly believed-in, sold-out to, and was likewise teaching “The Meal That Heals” LIE in a very impressive way. It was back on 12/0/01 that the Lord gave me a message to write entitled Perry Stone's Five Tornados! (12/9/01). In that sermonet it was predicted that Perry Stone would sell-out to the Roman Catholic Church and thereby pervert the Word of God through his teachings. This is being done through Perry's "The Meal That Heals" Mana-Fest Program, book, and video. What he is teaching is nothing less than the Roman Catholic Mass with it's unholy Eucharist. May I invite you to read an earlier sermonet series entitled Vampires In The Church at http://www.fmh-child.org. Please seek the Lord on what I am saying to you. Now what happened next was not at all what I expected to happen. Because you see it wasn’t too awful long after sending out that special e-mail to Sister Crystal that her “Cowboy Stuff Ministry” Website took on a new look. Her teaching series on “The Real Full Meal” just all of the sudden got gobbled up!!! It completely disappeared! I mean there wasn’t a trace of it remaining! Sorry about misspelling your name. Just another one of those human errors - I confess it. I noticed that you've removed all traces of "The Real Full Meal" from your Website. Does this mean you've seen the Light and had a change of heart? Confession is good for the soul and the people would like to hear about your's. I'm in the middle of writing our upcoming sermonet "Perry Stone And 'The Meal That Heals'?" Please pray about my request. Would love to hear back from you...and so would the Lord! Now as much as I hate to admit it, Sister Crystal never bothered to answer my e-mails. So do you think that just maybe she doesn’t want folks knowing her predicament? I mean getting duped by the Devil ain’t nothing to be proud of. However, just in case it might be of some consolation to Sister Crystal, I must say she had an excellent preacher (Perry Stone) teaching her to believe-in that particular LIE of the Devil. When taking communion---I suggest you take a whole cracker---look at it and begin to thank Jesus for healing your body. Tell Him you are taking this as heavenly medicine for your body. Thank Him that His body was broken so you could be whole. He was torn up so you could be well. He carried pain and death in His body so you and I could be free of pain, free of cancer, free of blood disorders, free of bone diseases, etc. Then break that cracker. Realizing that it was because of our sin that His body was broken, it was for our healing that stripes were laid on His back---His body was given to us---for our healing. Don’t just discern the blood---Jesus commanded us to discern His body also! Partake of His flesh! (John 6:53-58) Sound too gross for you? It did to His disciples also, and many left Him that day because of that saying. Will you? Will you choose to ignore His words and not lay claim to the price He paid for you and me in His body? How do we appropriate it? This is the awesome part. Get some grape juice or wine, which ever you prefer to use and keep it in stock along with crackers. Begin to make it a daily routine in your life to just take a few minutes and take communion. Each time you do, not only consecrate yourself to Him, but look at that cracker, break it and lay claim to what Jesus gave His body for---for your­ healing, for your soundness and peace of mind, for your total well being. Take it as daily medicine!! How many of you take medicine daily? I would go so far as to suggest that every time you have to take your medicine, take God’s medicine along with it! Give God equal time and opportunity! The great thing about this is, I don’t have to have total faith for instant healing---I have faith in what Jesus did for me in His body---faith enough to appropriate it personally, on a regular basis. I can know in doing this that each time I do it, I’m getting a little more well, healing is coming into my body, from God Himself, every time I lay claim to His body----my manna from heaven! "This tract deals very irreverently with the Sacrament of the Eucharist that was instituted by Christ himself. The basic justification for the Sacrament is found throughout the Bible. In the old testament, we have the account of the Passover where the spotless male lamb was sacrificed. In order for the Angel of Death to passover the house of the Israelites, the blood of the lamb had to be put on the doorpost and the flesh of the lamb had to be consumed. Only through this command of God would the family be spared! In the New Testament starting at John 6:22 and running through John 6:71, we see that Jesus says, not just once but four times, that we must eat His flesh and drink His blood in order to have everlasting life. This is so difficult to accept that many walk away. But the apostles stay, even though they do not understand what Jesus is saying. Finally at the last supper, Jesus gives the apostles the means to fulfill the command He gave in chapter 6 of John’s Gospel. He celebrates the last supper where He gives us His Body and Blood. So in the New Testament, we have the sacrifice of the sinless male lamb of God to allow us to passover into Heaven. The parallel with the Old Testament is unmistakable. The flesh of the lamb must be consumed to be saved!" Yup! That’s what Mr. Gallagher said and that’s what the Catholic’s believe. Because as it is found written in the Handbook For Today’s Catholic: "In every Mass, Christ is present, both in person of his priest and especially under the form of bread and wine. In every Mass, his death becomes a present reality, offered as our sacrifice to God in an unbloody and sacramental manner. As often as the sacrifice of the cross is celebrated on an altar, the work of our redemption is carried on [1333, 1350, 1372]. At Mass we offer Christ, our passover sacrifice, to God, and we offer ourselves along with him. We then receive the risen Lord, our bread of life, in holy Communion. In so doing, we enter into the very core of the paschal mystery of our salvation--the death and resurrection of Christ [1330, 1356-1359]." Everybody who’s in their right mind wants to be able to "live forever"; nobody should want to "die forever". And it’s these people who are involved in the worship service of Satan that can’t have the everlasting promise of life eternal because they don’t have their faith in (and a resulting life with) Jesus Christ. So in order for them to come up with their very own plan of salvation (and might I add one that won’t work) they have invented this "salvation process" called vampirism. And it was Bill the "ex" vampire who went on to tell us the rest of the story: "The very cornerstone of the Satanic cult’s existence and survival lay in the central ritual of Orthodoxy and Catholicism -- the Eucharist (Mass) or "Divine Liturgy."... doctrine of Transubstantiation (that the bread and wine is LITERALLY turned into the Body and Blood of Christ)..."
…So once again, don’t you think it somewhat a coincidence that one of the tools used in the study and practice of becoming a real life vampire is the Catholic’s doctrine of Transubstantiation (turning the communion bread and wine into the real life Body and Blood of Jesus Christ)? And don’t you think it strange that they both used the Scripture as found in the book of John for their source of inspiration and guidance to eat His flesh and drink His blood in order to have everlasting life. All right, so here we have a whole bunch of people chasing after Jesus, for days upon end, and none of them had anything to eat. Well, none of them except this one little boy. So what was Jesus going to do (WWJD)? He didn’t want them passing out from lack of food; they needed to be fed. They were physically hungry so Jesus did what was necessary to take care of their needs; He fed their stomachs: "And Jesus took the loaves; and when he had given thanks, he distributed to the disciples, and the disciples to them that were set down; and likewise of the fishes as much as they would. When they were filled, he said unto his disciples, Gather up the fragments that remain, that nothing be lost. Therefore they gathered them together, and filled twelve baskets with the fragments of the five barley loaves, which remained over and above unto them that had eaten. Then those men, when they had seen the miracle that Jesus did, said, This is of a truth that prophet that should come into the world. When Jesus therefore perceived that they would come and take him by force, to make him a king, he departed again into a mountain himself alone." So Jesus took food that was probably enough for one or two people and fed thousands, and ended up with more left over than when he started. Pretty slick huh? Well the people that got fed thought so too, because it didn’t take long for them to figure out that if Jesus was their king they would never have to worry about going hungry. They wanted Him to be their Fast Food King and they wanted Him bad. So once again, because of the out-of- control crowd condition, Jesus headed for the hills. But these people didn’t give up easily because, "The day following... When the people... had found him on the other side of the sea, they said unto him, Rabbi, when camest thou hither? Jesus answered them and said, Verily, verily, I say unto you, Ye seek me, not because ye saw the miracles, but because ye did eat of the loaves, and were filled. Labour not for the meat which perisheth, but for that meat which endureth unto everlasting life, which the Son of man shall give unto you: for him hath God the Father sealed." Now Jesus was and still is very interested in us having food in our stomachs (saving lives from physical death),... but this was not His main reason for being. You see Jesus’ bottom line reason for becoming a man on this earth was so that He could be the perfect sinless Lamb of God, Who would give His perfectly sinless life’s blood on the cross of Calvary, so that all who would believe in Him might have their souls saved from the eternal destruction of Hell (saving lives from spiritual death). But, try as He might, He was having an extremely hard time disconnecting these people’s brains from their stomachs. He wanted them to use their brains to think about their spiritual needs instead of their physical needs, but it seems as though they had a one track mind for food! But Jesus didn’t give up. Because as we continue on with the reading we find: "Then said they unto him, What shall we do, that we might work the works of God? Jesus answered and said unto them, This is the work of God, that ye believe on him whom he hath sent. They said therefore unto him, What sign shewest thou then, that we may see, and believe thee? what dost thou work? Our fathers did eat manna in the desert; as it is written, He gave bread from heaven to eat. Then Jesus said unto them, Verily, verily, I say unto you, Moses gave you not that bread from heaven; but my Father giveth you the true bread from heaven. For the bread of God is he which cometh down from heaven, and giveth life unto the world. Then said they unto him, Lord, evermore give us this bread. And Jesus said unto them, I am the bread of life: he that cometh to me shall never hunger; and he that believeth on me shall never thirst. But I say unto you. That ye also have seen me, and believe not." Now I really shouldn’t have to strain myself in order for you to understand this one. Jesus finally gets these folks to thinking about what He is saying, and that’s when they asked the question "What shall we do, that we might work the works of God?" And that’s when Jesus replies, "This is the work of God, that ye believe on him whom he hath sent." And right about that time they say "What sign shewest thou then, that we may see, and believe thee?" You see this whole entire conversation between them and Him was getting nowhere. They wanted to know what it takes to do the works of God, Jesus tells them to trust in Him, and they follow up by saying "prove that You are Who You say You are first". And guess what method they want Him to use to prove that He is Who He says He is? You guessed it; FOOD (BREAD)!!! But Jesus didn’t give up; He tried one more time. And just to please them, since they wanted nothing more than to talk about food, He goes along with the flow, but, with a slight twist. You see Jesus follows right along with their conversation on the manna (bread from heaven) by saying, "For the bread of God is he which cometh down from heaven, and giveth life unto the world." Now that was the statement that caught their ear. That’s the one word they wanted to hear; bread (food)!!! And that’s when they followed up His statement with their next request, "Then said they unto him, Lord, evermore give us this bread." But the question remains: did they really understand what He was talking about? Well they said they wanted the bread but Jesus let them know what The Bread was all about when He said, "I am the bread of life: he that cometh to me shall never hunger; and he that believeth on me shall never thirst. But I say unto you. That ye also have seen me, and believe not." Now do you really think that Jesus’ final statement really made them happy? I mean here they were, all pumped up about a food (The Bread) that was going to make them live forever, and then Jesus lowers the boom by telling them that He is The Bread. You see their brain was still connected to their stomachs (instead of their hearts) and that’s why: "The Jews then murmured at him, because he said, I am the bread which came down from heaven. And they said, Is not this Jesus, the son of Joseph, whose father and mother we know? how is it then that he saith, I come down from heaven? Jesus therefore answered and said unto them, Murmur not among yourselves. No man can come to me except the Father which hath sent me draw him: and I will raise him up at the last day... Verily, verily, I say unto you, He that believeth on me hath everlasting life. I am the bread of life. Your fathers did eat manna in the wilderness, and are dead. This is the bread which cometh down from heaven, that a man may eat thereof, and not die. I am the living bread which came down from heaven: if any man eat of this bread, he shall live for ever: and the bread that I will give is my flesh, which I will give for the life of the world." Are you starting to see the truth in this Scripture? You see it is absolutely necessary, when trying to understand the full message of what Jesus (The Word of God) is trying to tell us, that we look at the whole complete entire story. And it was this particular story that both the Satanist and the Catholics have distorted to fit their particular "beliefs". Because, Jesus, after having gone the extra mile in trying to make them understand the truth, is about ready to turn them off so that they don’t ever have to worry about hearing the truth anymore. 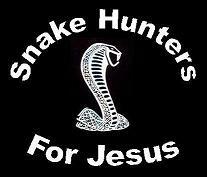 You see it’s a known fact that, if we want to be hard headed hard hearted people, God will help us get what we want. And that is why we read on to find:" The Jews therefore strove among themselves, saying, How can this man give us his flesh to eat? Then Jesus said unto them, Verily, verily, I say unto you, Except ye eat the flesh of the Son of man, and drink his blood, ye have no life in you. Whosoever eateth my flesh, and drinketh my blood, hath eternal life; and I will raise him up at the last day. For my flesh is meat indeed, and my blood is drink indeed. He that eateth my flesh, and drinketh my blood, dwelleth in me, and I in him..."
And just as predicted these very harsh words not only took hold of the unbelieving Jews but also His very own close disciples. Because as we read on in verse 59, "These things said he in the synagogue, as he taught in Capernaum. Many therefore of his disciples, when they had heard this, said, This is an hard saying; who can hear it? When Jesus knew in himself that his disciples murmured at it, he said unto them, Doth this offend you? What and if ye shall see the Son of man ascend up where he was before? It is the spirit that quickeneth; the flesh profiteth nothing: the words that I speak unto you, they are spirit, and they are life. But there are some of you that believeth not. For Jesus knew from the beginning who they were that believeth not, and who should betray him. And he said, Therefore said I unto you, that no man can come unto me, except it were given unto him of my Father. From that time many of his disciples went back, and walked no more with him." You see Jesus’ intended meaning of "Except ye eat the flesh of the Son of man, and drink his blood, ye have no life in you" was not what some took it to be. He said what He said for a reason and it wasn’t meant as instruction for anybody to drink His blood or eat His flesh. Because He then went on to explain it in a little more detail by saying "It is the spirit that quickeneth; the flesh profiteth nothing: the words that I speak unto you, they are spirit, and they are life". Shew/Show (G2605) [kat-ang-gel'-lo] - From G2596 and the base of G32; to proclaim, promulgate: - declare, preach, shew, speak of, teach. You see “Communion” is meant to be a “reminder” of “Jesus’ death” until “He comes” by symbolically “showing” His “Flesh and Blood” that was given for our sins. And the way it’s done is by the Believer “consuming” the symbolic “bread and grape juice”in a “reverential act of worship”. In fact if your really want to “see” the real-life “picture” of “Communion” working in the “Believer’s life” to give him/her “life”, then check out our sermonet Life Through The Flesh And Blood Of Jesus! (11/28/04)”. And after having said all of that, let me say the following once again: So was that one strong enough for you – or maybe just a little bit TOO STRONG? I mean without a doubt those were some pretty “tough and rough” Words for anyone to speak about someone so charismatic (captivating, charming, and appealing) as Brother Stone. In fact I am personally (me, myself, and I) having a very hard time believing that Perry Stone has actually “gone and done” what he’s actually “gone and done”. Now after having said all of that, the “burning question” that needs to be answered is “Why has Perry Stone sold out to the Roman Catholic Church by promoting the Roman Catholic Mass (The Meal That Kills) to the Protestant Believers in such an appealing way (The Meal That Heals)? Well the answer to that question all goes back to the preceding God-chosen Scripture for Brother Stone. Because you see God says that he is a lying, slow belly type of evil beast, who through his unruly and vain talking deceives and subverts entire Christian households for filthy lucre’s sake. And just in case you don’t understand what that word “lucre” means, in the plain and simple, it stands for “increase”. So just what is “it” that Perry Stone is willing to sell his soul to the Devil “for” in order to make “it” increase? Well that one’s easy! It’s his ministry!!! Because you see in order for him to become a part of the number one “Christian television broadcasting network” in the world – Trinity Broadcasting Network (TBN) – and likewise grow his “viewing audience” really, really big, he had to bow down to the demands of it’s owners; Paul and Jan Crouch. And just in case you didn’t already know it, in order for Paul and Jan Crouch to remain as the number one “Christian television broadcasting network” in the world they had to bow down to the spirit of Anti-Christ within the Roman Catholic Church.